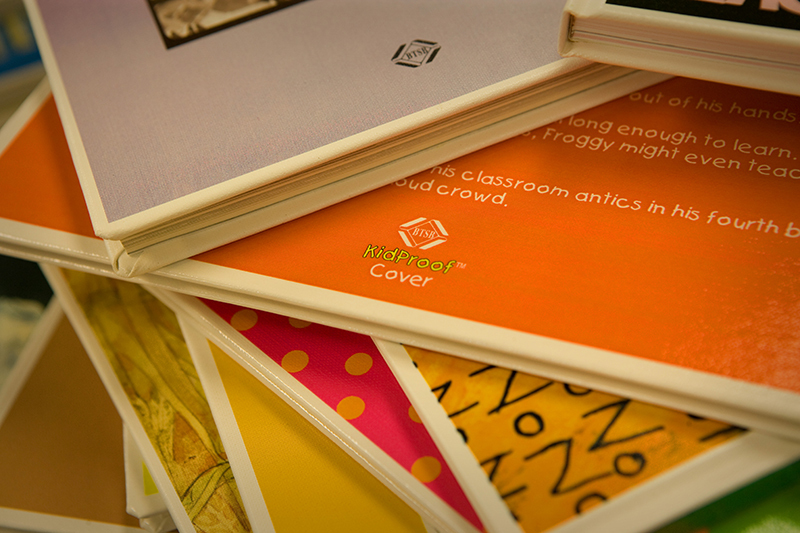 The corners on these KidProof books are our one-of-a-kind Library Corners, which guarantee maximum durability. A BTSB Kidproof Picture Cover. 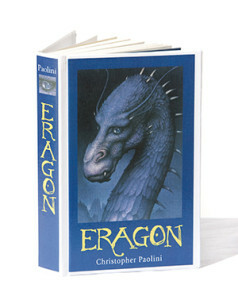 Bound to Stay Bound Books is known for producing the highest quality pre-bound library books in the industry. Our books exceed the American National Standard for binding (ANSI Z39.78-2000) to give them superior quality, appearance, and most importantly, long life. These specifications and testing are designed to provide libraries with durable, high quality books that they deserve. All of this sounds good but many people want to know more specifics about the difference between a Bound to Stay Bound pre-bound library book and other library books available. Bound to Stay Bound continually researches ways to improve our product for our customers. You may have noticed some of the improvements over the past several years. The BTSB Picture Cover Plus is a cover that is imprinted with each title’s original artwork. The blurb from the book jacket is printed on the back cover of every Bound to Stay Bound book. If a publisher jacket is not available, the summary of the book is printed on the back cover. One of the more noticeable changes that have been made over the past several years are the KidProof covers. This new material was designed specifically for Bound to Stay Bound Books to increase the durability of the already strong cover material used. Bound to Stay Bound is the only company that uses this unique material for our book covers. The covers are printed and laminated to seal in the color and provide a glossy, durable, washable finish to our books. All books cases are made using library corners. This can be seen by opening the cover of a Bound to Stay Bound book. You will notice a double fold of our KidProof cover material on both sides of all four corners that reinforces the book corners; protects them against fraying, bending and turning; and thus assures greater durability and longer life. This causes the corners of the cover to appear to be a bit rounded. Side sewing is one method that Bound to Stay Bound uses to prebind books. The binding of choice is and always has been sewn pages. Side sewing or over sewing the book pages is the strongest possible binding option. There are times that the books do not have enough of an inner page margin for Bound to Stay Bound to sew the pages so an alternative to sewing is a PUR (polyurethane reactive) adhesive. This is a pliable, flexible adhesive that is meant to be opened and closed and offers an excellent alternative to sewing. All Bound to Stay Bound Books are guaranteed to last hundreds of circulations. 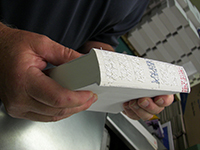 Polyurethane reactive adhesive being applied to books. A triple end sheet with a linen hinge is used that locks the sewn thread in place for extra strength. This allows the book to open at the back of the spine, thus leaving no pressure on the sewing or stitching of the pages. This is noticeable when you open the front cover of the book and it opens next to the spine rather than opening to the sewing, as in what are called “wide hinge books”. Since a Bound to Stay Bound book lasts for hundreds of circulations, we always choose a higher quality paper for our books. What good is a high quality binding if the paper pages won’t last. The only time that a lower quality paper is used in a Bound to Stay Bound book is when there are no other paper alternatives available. BTSB pays close attention to the binding details and does not sacrifice steps to make our pre-binding process faster. Many of these processes are not noticeable to librarians but affect the quality of the books produced. 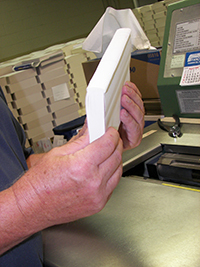 As books are received from the publisher, they are inspected before even starting the BTSB binding process. A linen back lining extends down the sides of the book block onto the pages, acting as a bumper between the book and the cover. This offers more strength holding the book block to the cover of the book. Every Bound to Stay Bound book is inspected before receiving the gold seal in the inside front cover of the book to insure the highest quality and craftsmanship. Our Bound to Stay Bound customers have noticed the BTSB difference. There are over 30 customer testimonials on the BTSB website where our customers say they purchase from Bound to Stay Bound because “the books last, don’t fall apart, will last a lifetime, books hold up to locker crunches, football practice and students using them as last minute snowboards down a hill!” Listen to customer testimonials at https://www.btsb.com/aboutus/customers/. Listen to more testimonials here! We at Bound to Stay Bound are proud of that “claim to fame” in the library book industry. We’d like to step up the durability testing of our Bound to Stay Bound books and are creating some videos showing the durability of a BTSB book. The BTSB Book Durability Challenge: The first challenge is BTSB books versus a school bus. Watch and see! Like us on Facebook and follow us on Twitter to see more upcoming BTSB Book Durability Challenge videos. Have an idea for other challenges? Send it to us at facebook.com/BTSBBooks, @BTSBBooks on Twitter or email us at btsb@btsb.com.